compare practical results with theoretical analysis. Negative feedback is produced by feeding a portion of an amplifier output back to the input and applying the feedback quantity in opposition to the input. The result is stabilized gain, extended bandwidth, reduced noise and distortion and modified input and output impedances. A basic configuration of feedback system is as shown in fig. 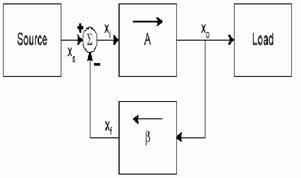 This is a signal-flow diagram, and the quantities X represent either voltage or current signals. So the negative feedback reduces the signal that appears at the input of the basic amplifier. Where , Af =loop gain. 1 + A Î² =amount of feedback. The gain of the feedback amplifier is almost entirely determined by the feedback network. Based on the quantity to be amplified (voltage or current) and on the desired form of output (voltage or current), amplifiers can be classified into four categories. The circuit consists of a basic transconductance amplifier with open loop transconductance gain Gm. The feedback network samples the output current (Io) and produces a feedback voltage( Vf), which is in series with the input signal voltage (Vs). The input impedance and output impedance of current series feedback amplifier increases as compared to the basic tranconductance amplifier. Current series feedback stabilizes transconductance gain(Gm) of amplifier. b) Apply signal source Vs =20mVp-p, 1KHz and measure output voltage Vo. c) Connect 1K resistor in series with input signal Vs and measure voltage Vb across 1k resistor. h) Compare the practical results with theoretical results.